For some time now I've wanted to make a toy battleship in the same style as the WWI Krupp gun that I made a couple of years ago (you can see it here). 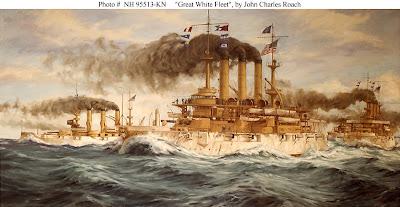 A ship in the livery of the "Great White Fleet" is what I had in mind, but chunky, simplified, and obviously the type of toy that might have been under a Christmas tree in 1898. My favorite kind of toy projects are the ones that require no specially purchased wood, I just used scraps that were on hand. Lengths of 2x4 formed the hull. Positions for the sponson guns were transferred using carbon paper (a staple of the shop). I used hole drills on the drill-press to make the gun positions, finishing them off on the bandsaw. Stacked, glued, and clamped the hull is complete. Now came the various gun turrets. Again using stock on hand, the sander came into play. Primary and secondary batteries are finished. All the subassemblies fit together and are ready for painting, and the ship will be ready for launching. Eleven-inch guns loom over the victorian sky-light on the fantail. The secondary battery of six-inch guns and the smaller three-guns will make the Spaniard fleet quail. When borne by the red, white and blue. The boast of the red, white and blue.